MORPOL Engineering Services Limited conducts its business in a manner that is compatible and well balanced between a responsible HSSE standards and the economic needs of an international Company. Individual motivation for a sound performance in a workman-like manner with a close liaison between Quality and HSSE is the second stage in implementing HSSE. This is feasible by using an effective recruitment process and selecting subcontractors based on their performance in relation to HSSE standards. MORPOL does not hesitate to demonstrate its concern for HSSE and considers compelling the labour force to adhere to the policy at all times. Our policy addresses the Health, Safety, Security and Environmental risks to our operations and the potential impact on our host communities and staff; with strong management commitment at the highest level. This reflects good working practices and it is mandatory in all the Company’s operations. 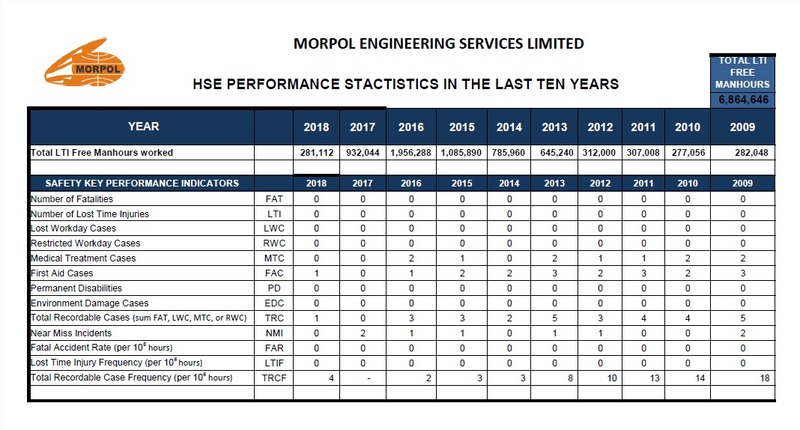 In MORPOL Engineering Services Limited the management at all levels provides strong, visible leadership, commitment and personal involvement in all aspects of Health, Safety, Security and Environment. Making HSSE the first priority on personal and collective agenda. Proactive leading and supporting HSSE by showing good example (e.g. correct PPE, obeying HSSE instruction, attendance at HSSE meetings, active participation in HSSE matters, etc.). Treating HSSE as a business-critical activity. Promoting and leading compliant HSSE Culture and initiatives. Participating in HSSE visits and management walkthroughs. Generally HSSE is everyone’s commitment in MORPOL, therefore, every employee is expected to perform his responsibilities as contained in the Company’s HSSE policy. MORPOL Engineering Services Limited to be a leading Health, Safety, Security and Environment (HSSE) compliant company offering Engineering, Procurement and Construction (EPC) services to the Nigerian industry with the best HSSE culture and practices. Federal Government/NNPC/NGC commendation for timely and safely delivery of Papalanto 24” x 36km gas pipeline in 2013. SPDC HSSE capability upgrade from Amber to Green between 2014 and 2015 on Gbaran Infill Project Package 2. SPDC Meritorious safety performance award in 2016. Commendations from Communities on GIPP2 project. MORPOL inducted as a Corporate Member of the Institute of Safety Professional of Nigeria (ISPON) in 2017.